What would it be like if you could go back in time to selected moments and just look around a little? Well, we all know that’s not possible in the real world. 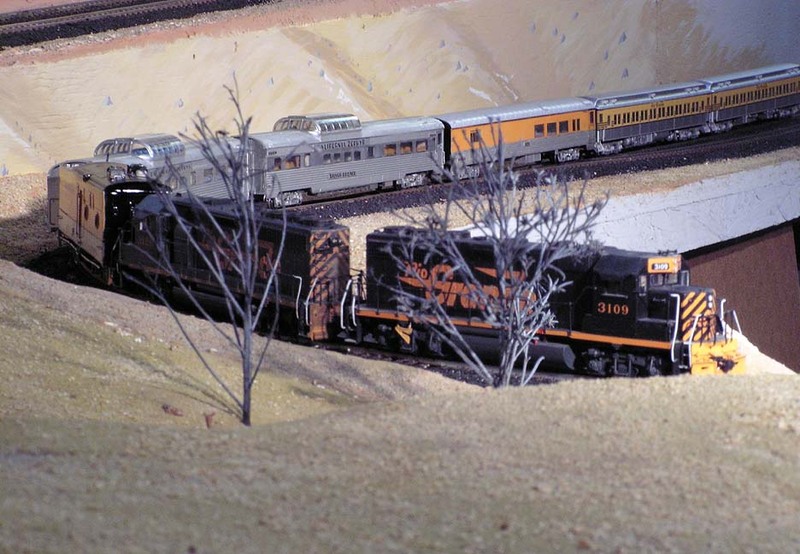 In the world of model railroading, however… things are a little more flexible! What follows is a chronological look at the Moffat Route over the past 50 years. I’m restricting our photo opportunities to one per year (or less), to keep it simpler. 1964. 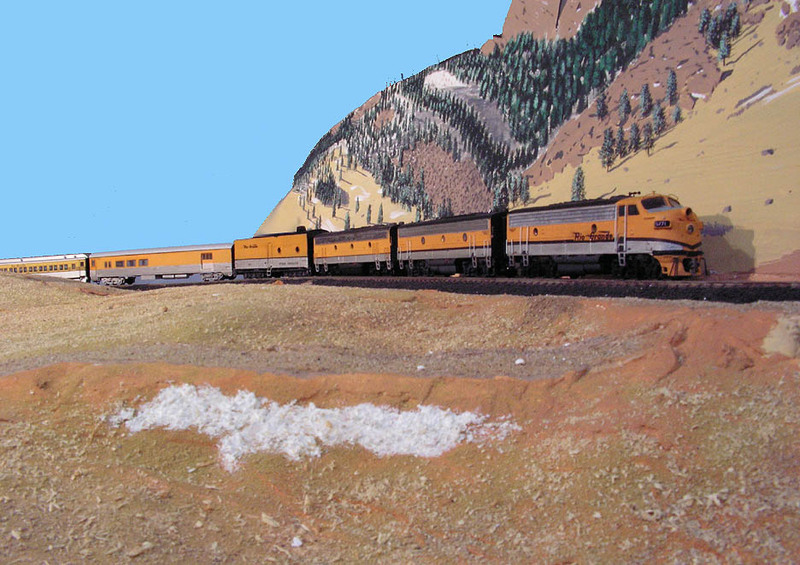 The Prospector, D&RGW’s overnight train between Denver and Salt Lake, descends the front range just after sunrise. Note the piggyback car behind the lounge. 1970. 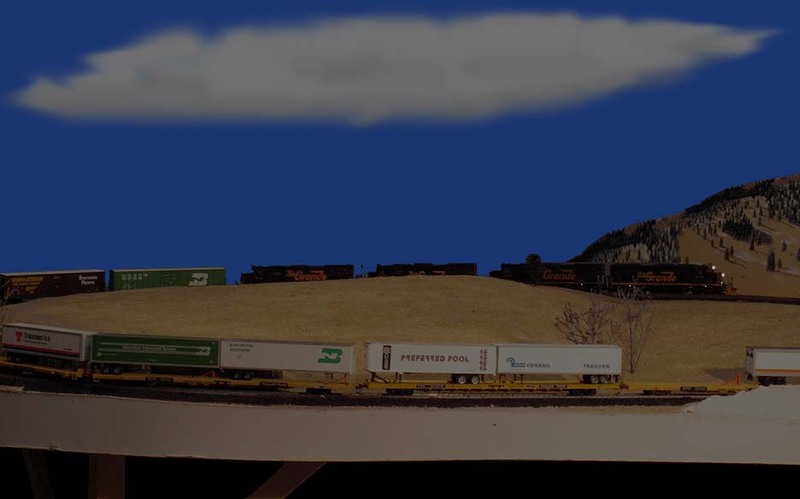 An eastbound coal train below Pinecliffe is headed by a relatively-new SD45, along with a GP30 and GP35. All of these units are relatively new at this point, as locomotives go. 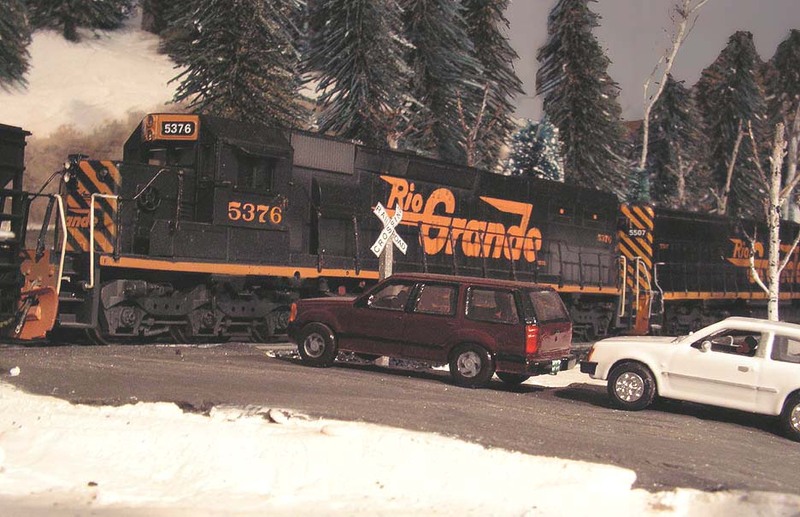 Note that all are in the then-standard road-switcher scheme with the small flying Rio Grande. 1971. The California Zephyr met its demise the previous March, and the Rio Grande has decided to continue its portion of the route as an every-other-day operation known as the Rio Grande Zephyr. Here it is climbing up towards the Big 10 curves. 1974. This year brings the first of a new model of 6-axle power, the SD40T-2. Also known as “tunnel motors”, these units come equipped with deck-level radiator intake vents at the rear of the long hood. Here, several of the new units led by No. 5348 exit Tunnel 2. 1975. 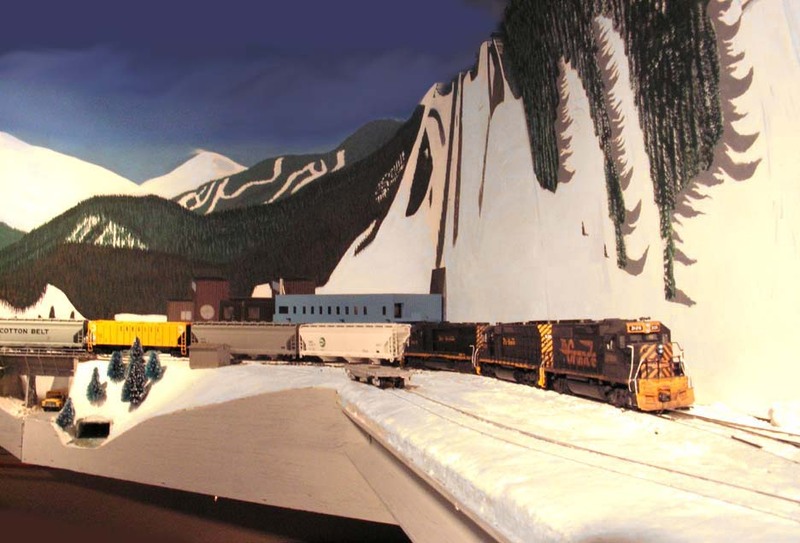 Operations west of the Moffat Tunnel often include a shove from the West Helper, based down at Tabernash. 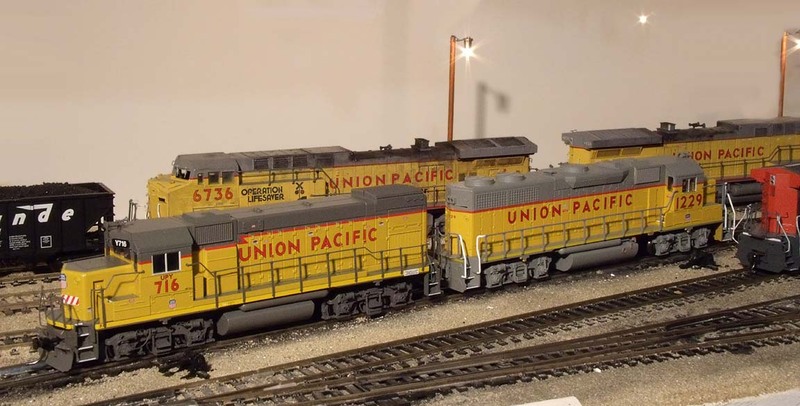 Here, a GP30 / GP40-2 pair do the honors for an eastbound freight. 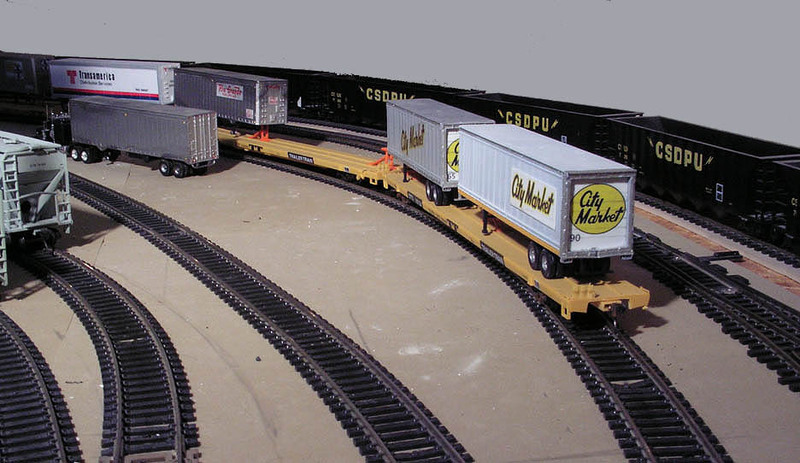 Rio Grande practice allowed for no more than eight powered axles pushing behind a caboose. 1976. 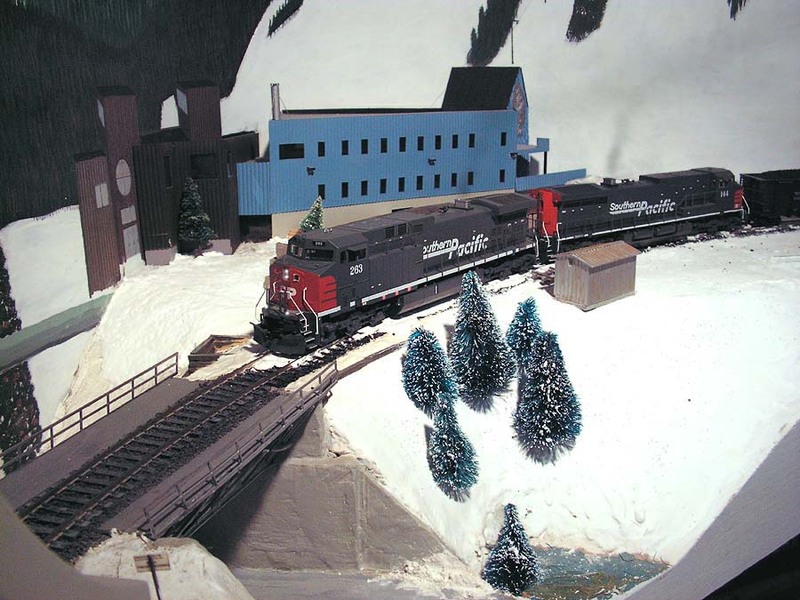 A typical run of the Ski Train has a pair of GP40-2’s for power, and steam generator car No. 251 to provide heat for the steam-heated coaches. Combine No. 1230 is just behind the steam generator car. 1977. Tunnel motors are becoming increasingly numerous, and are proving their worth in the tunnel district. 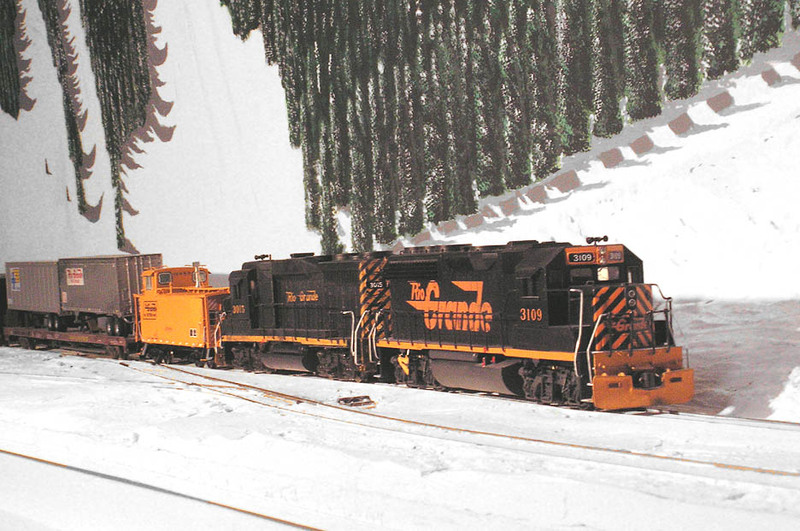 Here, three SD40T-2’s led by No. 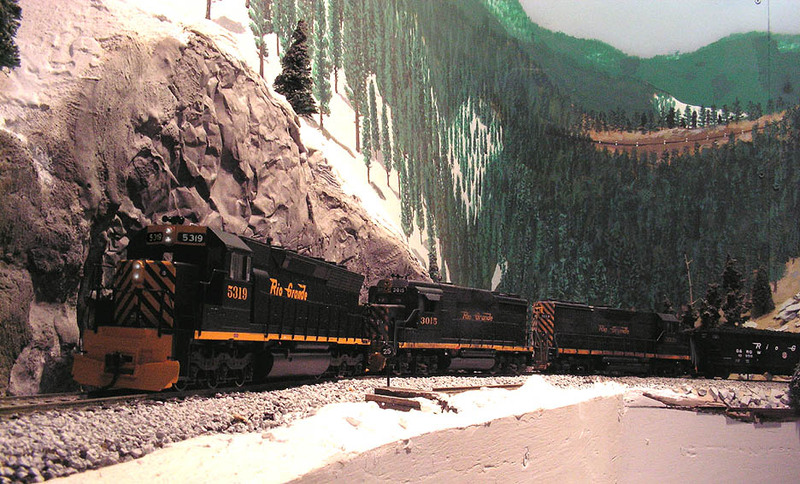 5376 (plus an SD45) are leading a loaded coal train through Hideaway Park. The driver of the microbus is no doubt cursing his timing– he’ll have to wait for the slow 73-car train to grind its way up the hill before he can return to his condo! 1978. February 25, to be precise. 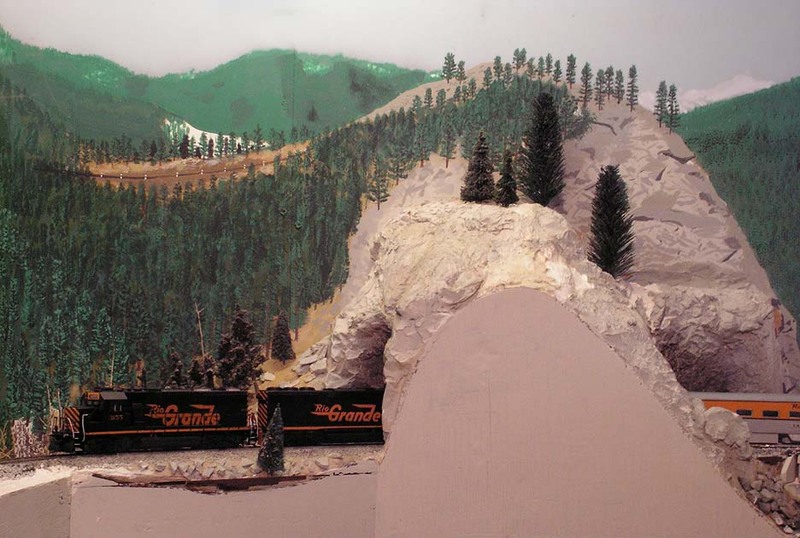 The Moffat Tunnel was celebrating its 50th anniversary, and the railroad ran a special Rio Grande Zephyr for the occasion. The longer RGZ required more power than the F9 trio could provide, so they were bumped down to the Ski Train, which is seen here at Clay. 1979. At the piggyback track at North yard, City Market trailers have been loaded for the overnight trip to Grand Junction. Another van is being positioned for loading. This is the era of 40-foot trailers. 1980. 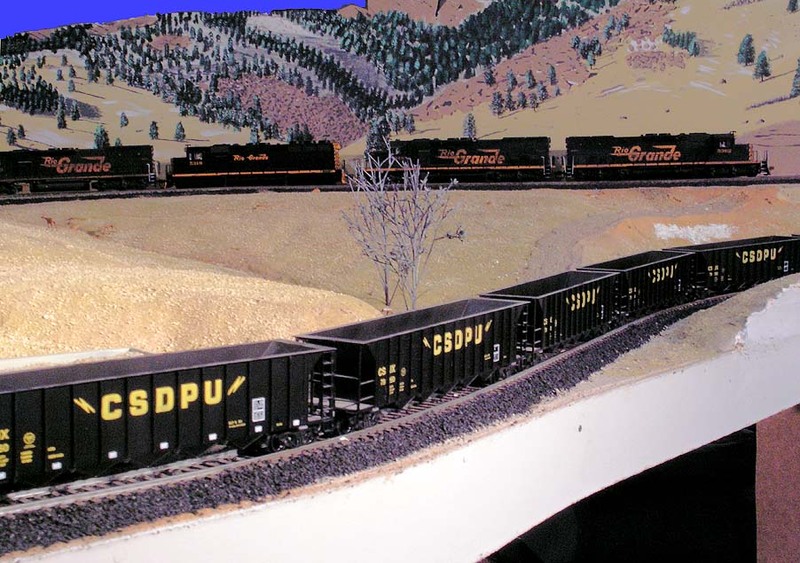 Coal is booming, and unit coal trains are beginning to proliferate. 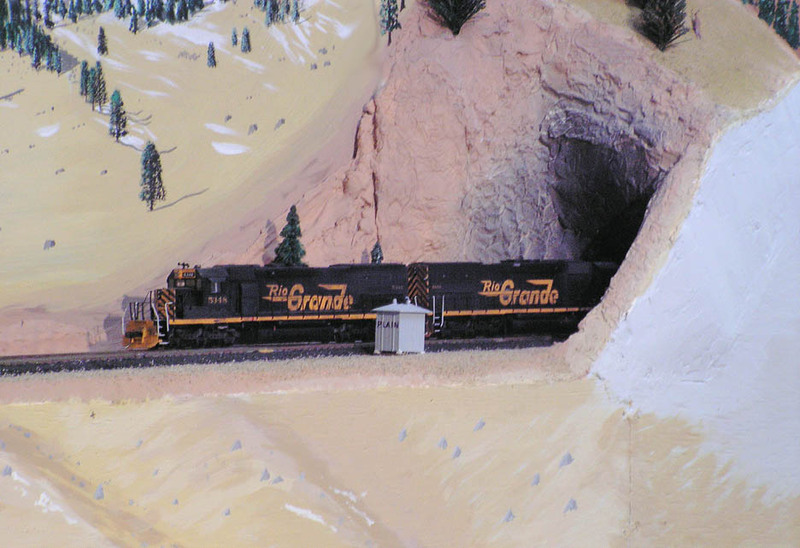 Here, a unit train of Thrall gons for Public Service Company of Colorado (PSCX) is rolling through Tunnel 29 below Pinecliffe. 1981. Train 183 is moving Cargill grain west from Denver. 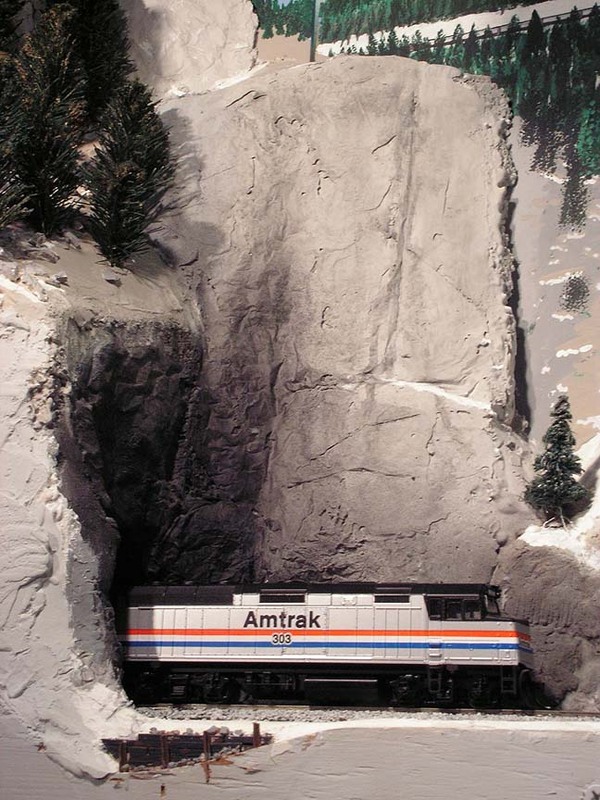 Here it’s just exiting the west portal of Moffat Tunnel. The ski area has recently expanded its facilities, adding several modern lodge buildings at the base. 1982. The Ski Train is running its annual special for the mayor of Denver. Today it is borrowing two dome coaches from the RGZ. We see it rounding the lower curves of the Big 10 loops. 1983. It’s the swan song for the Rio Grande Zephyr, which will make its last runs in April. Here, a shortened mid-week No. 17 is passing Clay siding. 1984. 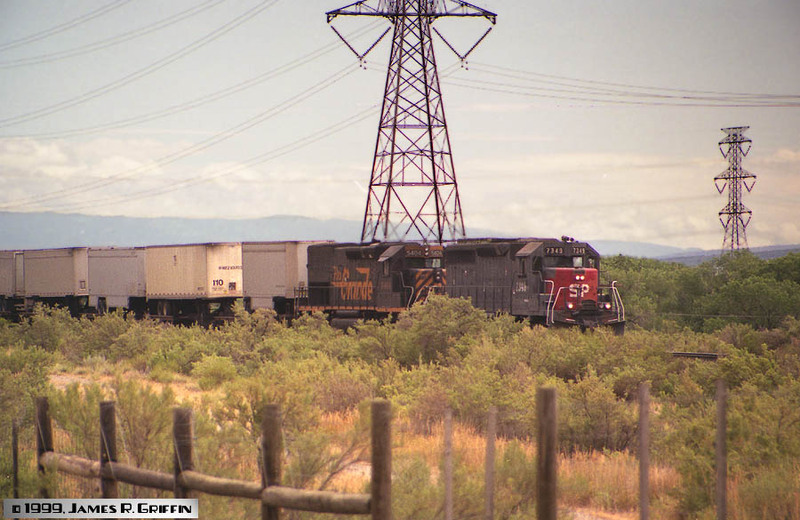 At Big 10 we see a fixture of the Moffat line, the Colorado Springs utilities unit coal train (reporting marks CSUX). 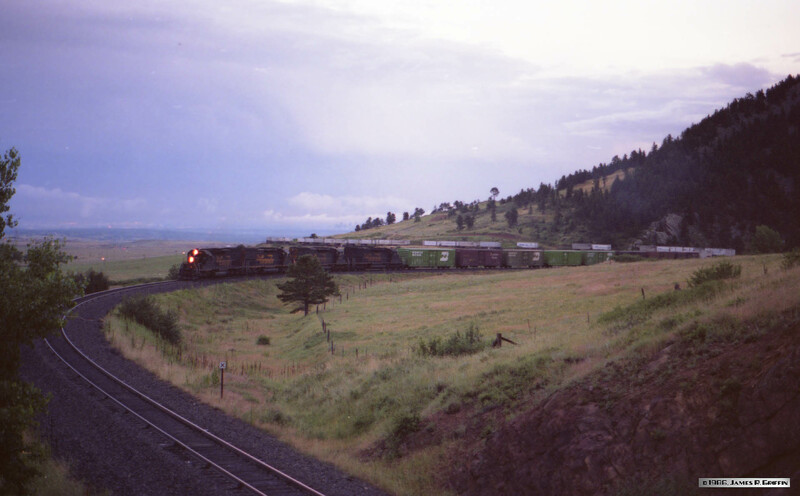 For 20 years this train made trips between the coalfields of north-west Colorado and the two powerplants in/near the Springs. 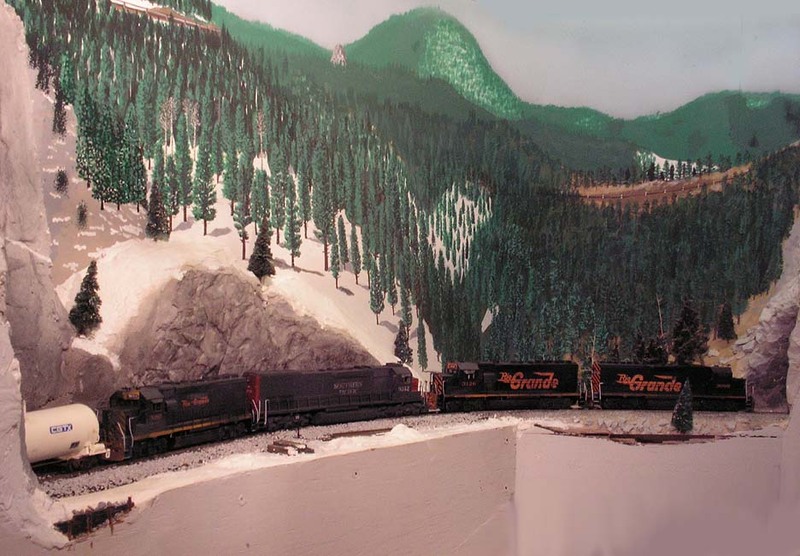 Today, four tunnel motors and an SD45 power the empty train up the hill. 1985. SD50 No. 5507 pops out of the Moffat Tunnel westbound. 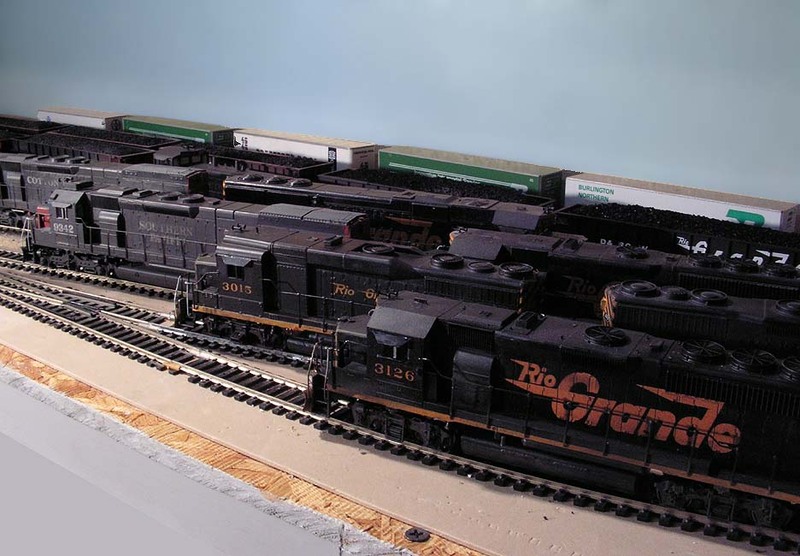 In the latter part of 1984, the Rio Grande had taken delivery of 17 SD50’s, being the last six-axle units the railroad would acquire prior to mergers. 1987. For about four years now, Amtrak has been routing its California Zephyr across the Rio Grande. Here, No. 5 is led by F40PH No. 303 as it exits Tunnel 27. 1988. Rio Grande’s train 103, the westbound Railblazer, is passing Vasquez Road after dusk. This train was the ultimate hotshot sprint train, carrying trailers overnight between Denver and Salt Lake City (and vice versa). 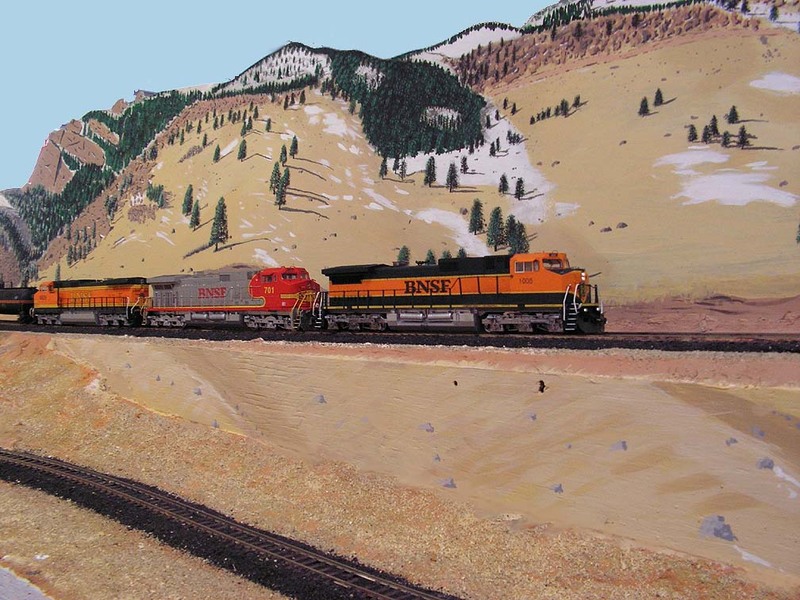 In Autumn of 1988, Rio Grande Industries acquired Southern Pacific Transportation, creating a new merged railroad system which was comprised of SP, Rio Grande, and the St. Louis & Southwestern (SSW, or Cotton Belt). For a while at least, the D&RGW maintained its operating identity, but SP power started showing up on the Moffat in increasing numbers. 1989. Westbound freight No. 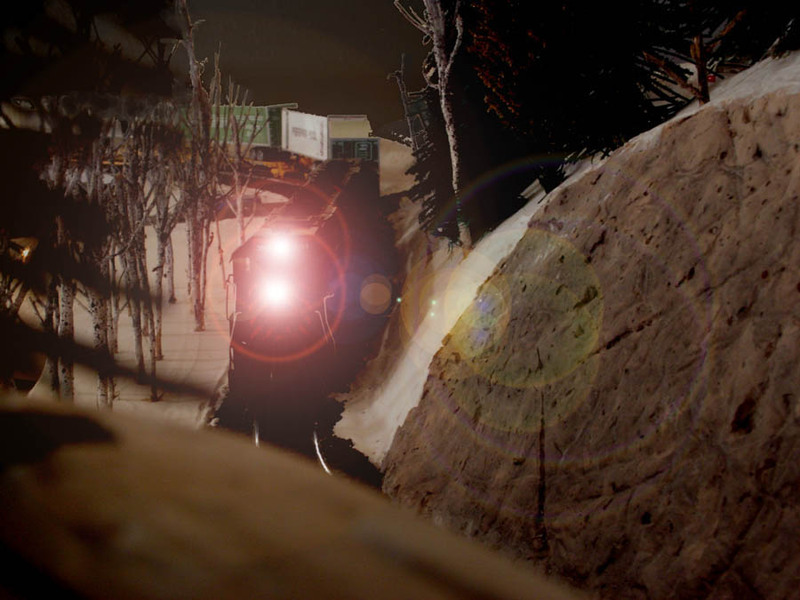 187 is approaching tunnel 29, with a Southern Pacific SD45T-2 in the consist. See here for a similar movement from December 1988. 1990. 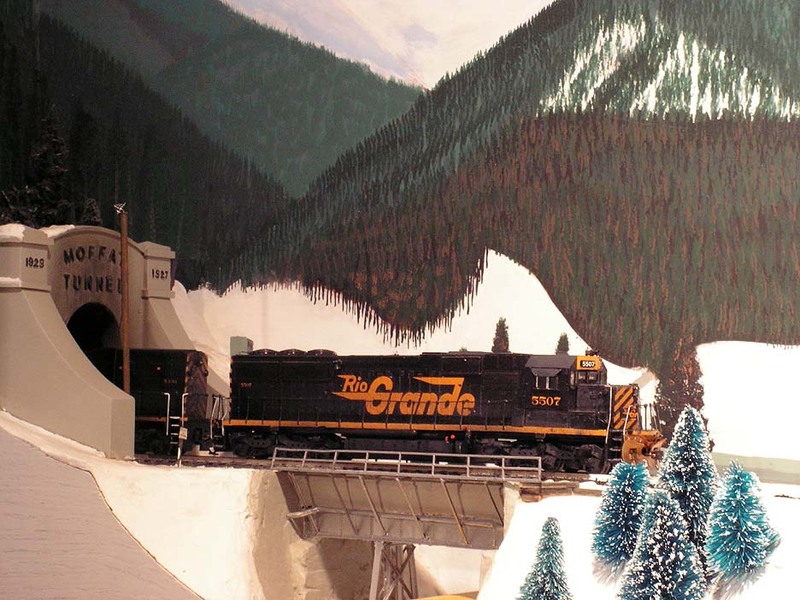 The Ski Train unloads passengers at the Winter Park ski area. 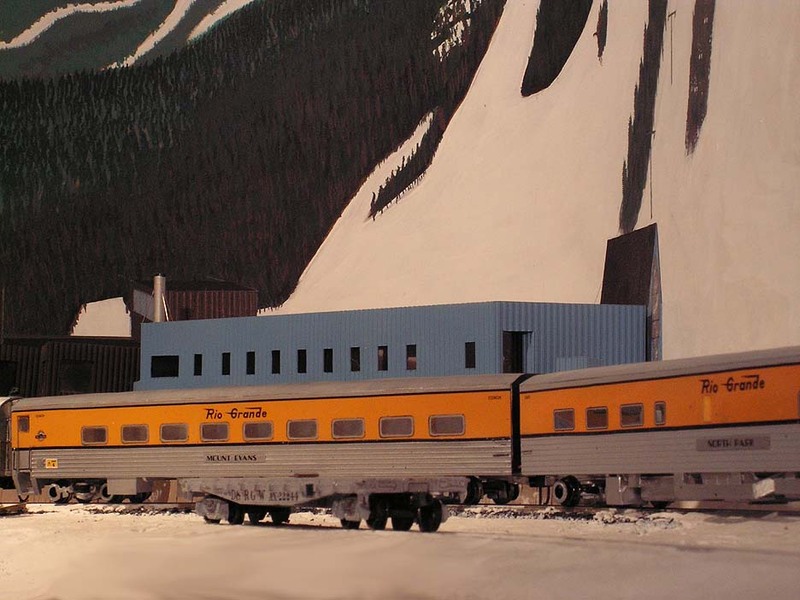 The owners of the railroad had re-equipped the train in 1988 with second-hand Tempo cars from Canada, and re-launched the service as a luxurious yet economical way to reach the slopes. The train has been a great success. 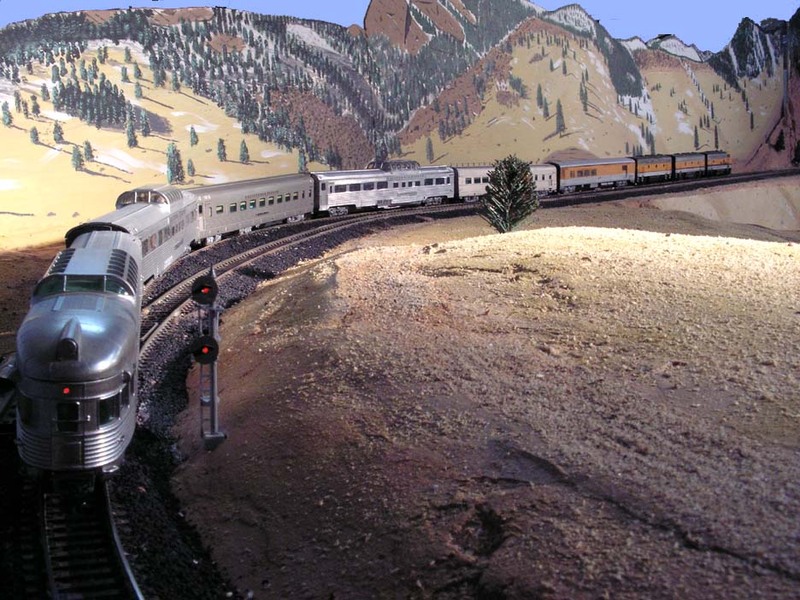 Interestingly, though, the train is not owned by the railroad, but rather by a private company of Phil Anschutz. 1991. The face of the service tracks and ready line has begun to change. 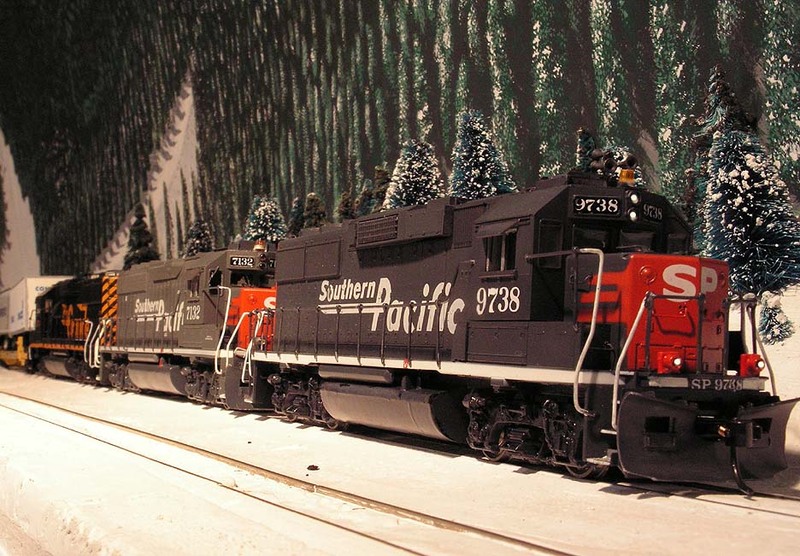 Many more SP locomotives are present. To be sure, run-through power had been making appearances since the early 1980’s, but the pendulum has begun to swing towards SP dominance. Also note the trailers parked in the background. BN had recently completed a new intermodal facility on the land across from and parallel to the yard bypass track. 1992. 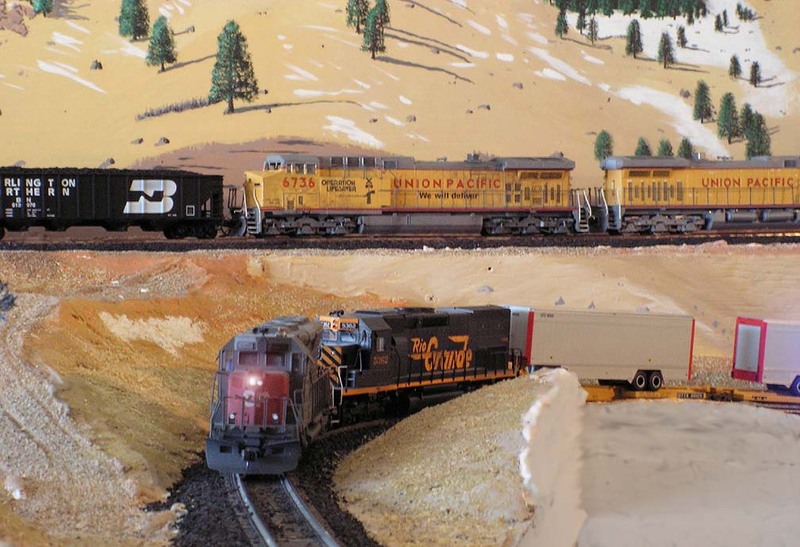 A pair of 6-axle home-road units are working as the swing helper on a coal train approaching West Portal. This is in January. A couple of months later, the decision was made to emphasize the SP brand, which included a new, fully-integrated operating philosophy. Solid sets of Rio Grande power became a thing of the past. 1992 marks the de facto end of the Rio Grande as an operation. 1993. Train DVOAF hustles priority trailers through Winter Park. Two new GP60’s are spliced by a GP40M. 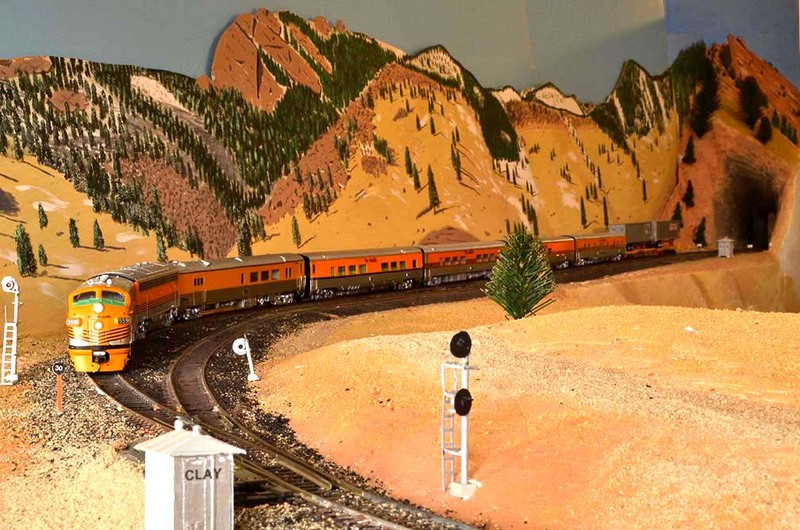 The first two units are wearing the new Rio Grande-inspired merger paint scheme. 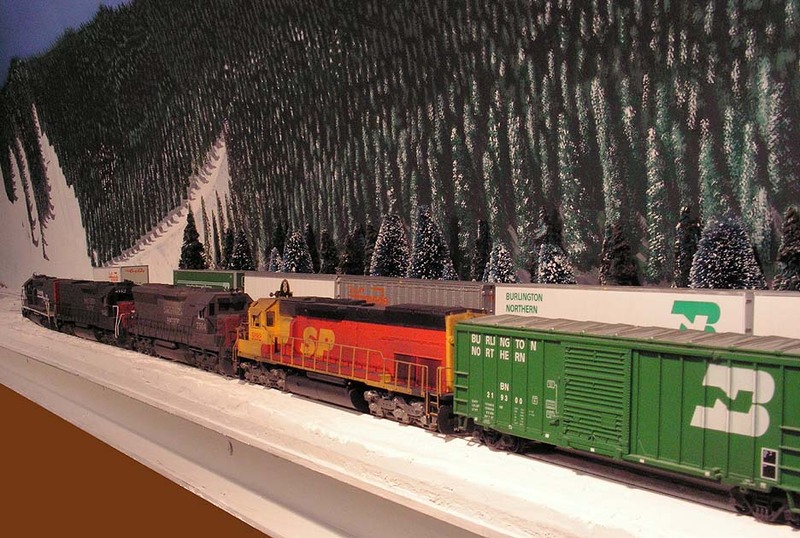 Trailing is one of the last 3 units delivered in DRGW paint, No. 3155. 1994. 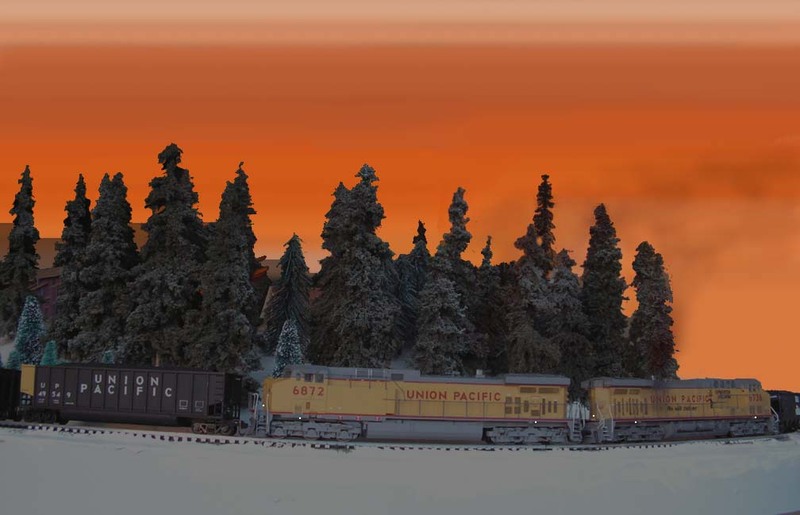 Symbol RODVM waits in Winter Park siding for the passage of DVOAT. The SP system used alpha symbols for its trains; in this case, DV = Denver, OA = Oakland, RO = Roper (the ex-DRGW yard in Salt Lake). The last character is the train type: T = Trailers, M = Manifest freight, F = Forwarder (priority freight). 1995. Amtrak as been updating its equipment during this period. Here, No 5 sports a pair of P40 locomotives built in 1993, and several Superliner 2 cars (in the Phase IV paint scheme). 1996. 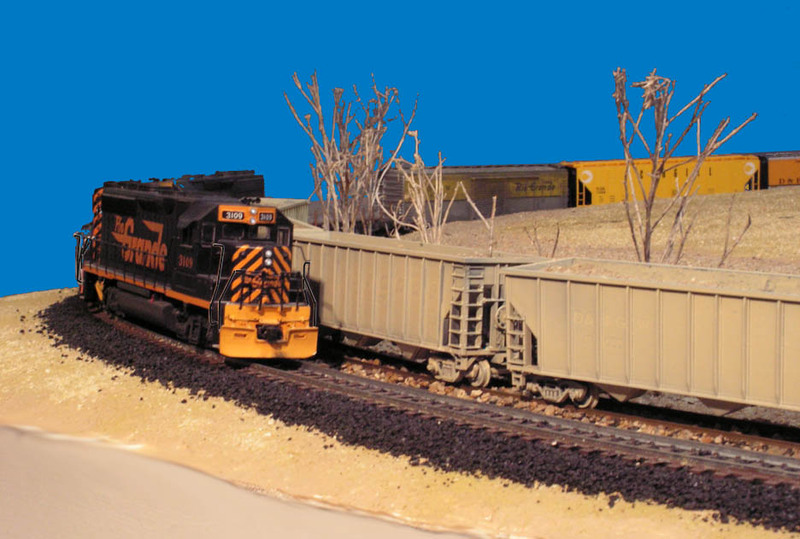 It’s February, and a pair of eight-month-old SP AC4400s lead coal train EYCKC. It’s about to enter the Moffat Tunnel. A pair of remote helpers is on the rear. SP’s final new locomotive fleet put a final exclamation point on the road’s history; it would merge with Union Pacific later this year. 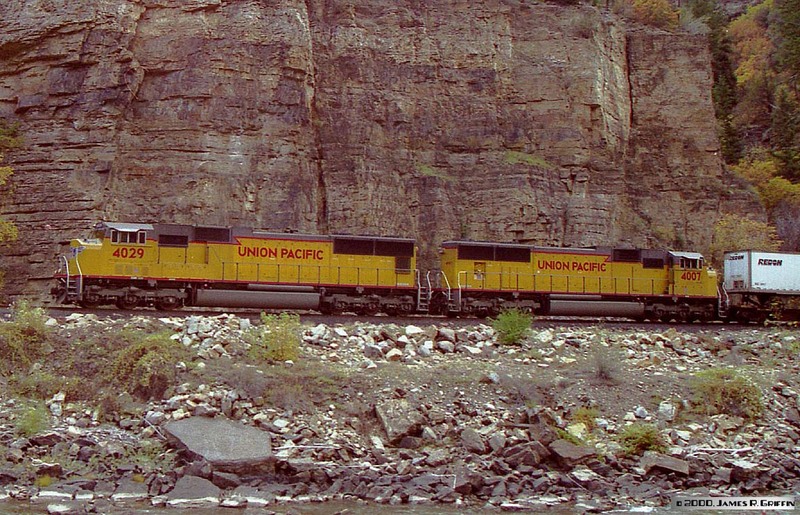 In September 1996, Southern Pacific merged with Union Pacific, with UP being the surviving identity. Merging two nearly-equally-sized systems meant that the SP image stayed around for a long time, at least in terms of equipment. Even Rio Grande power (what remained) was fairly commonly seen in its old haunts, as much was brought “home” by Colorado and Utah management. 1997. One of the first, and most ironic, changes after the UP merger: the return of DRGW power to the Ski Train! The 1996-97 season featured a pair of Rio Grande GP60s for power. Here the train passes eastbound through Tunnel 29. 1998. The new face of the Moffat line, UP SD90/43 MAC No. 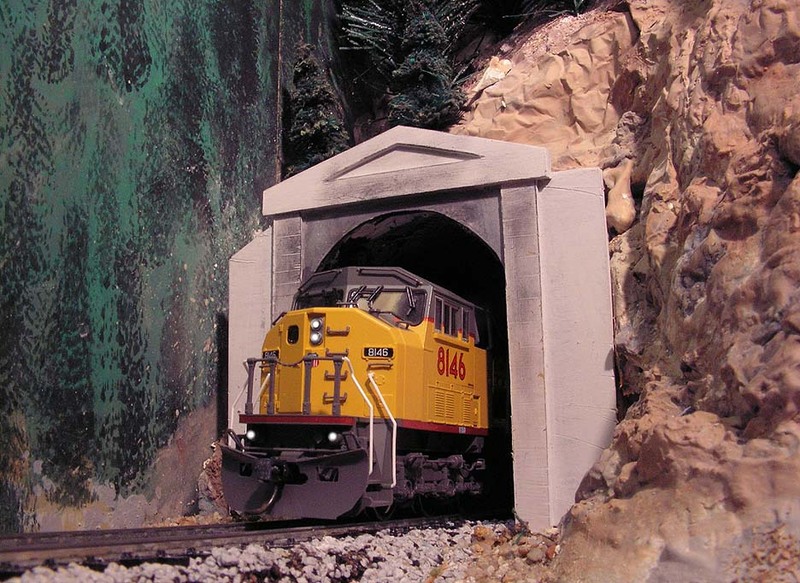 8146 pops out of Tunnel 30. 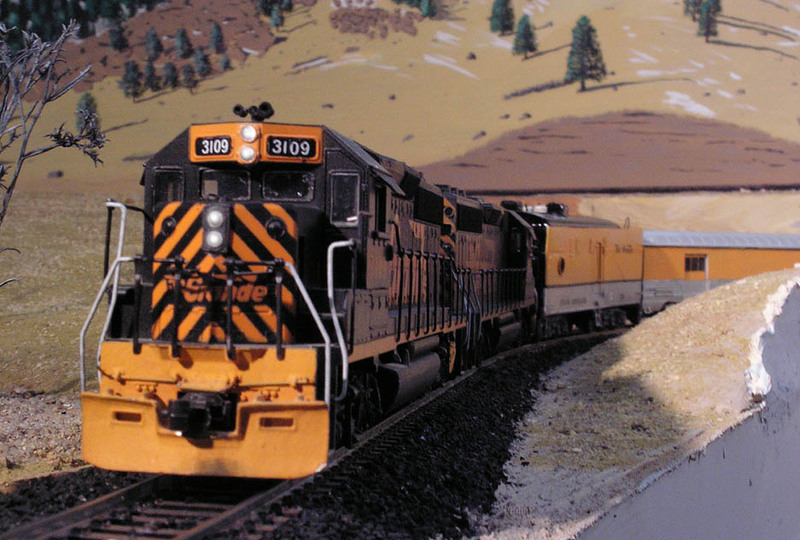 Yellow power would become increasingly more frequent as time passed and older units were repainted or retired. 1999. 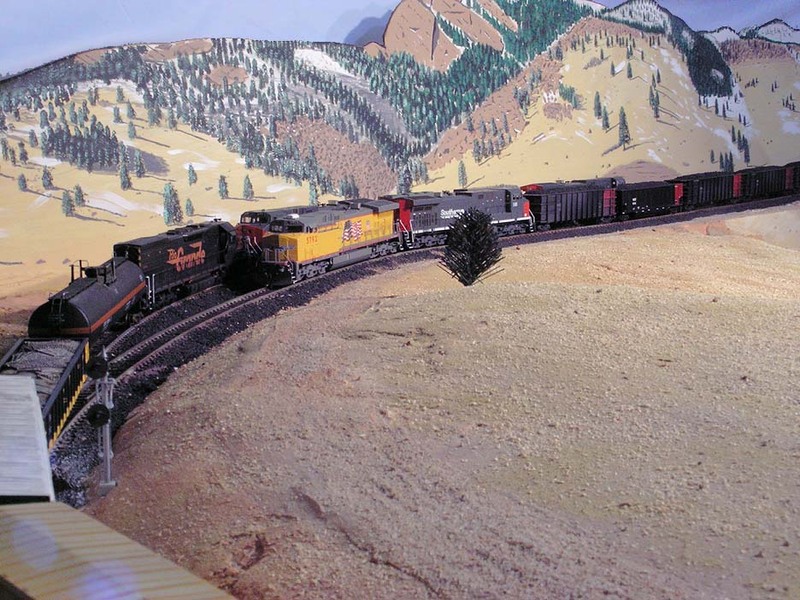 A common scene, the westbound CSUX train meets an eastbound coal load at Rocky. SP power (in the form of AC4400’s) was still well-represented for several years after the merger. 2002. UP traffic on the Moffat be this time was mainly coal, coal, and more coal, with a single manifest freight each way daily. 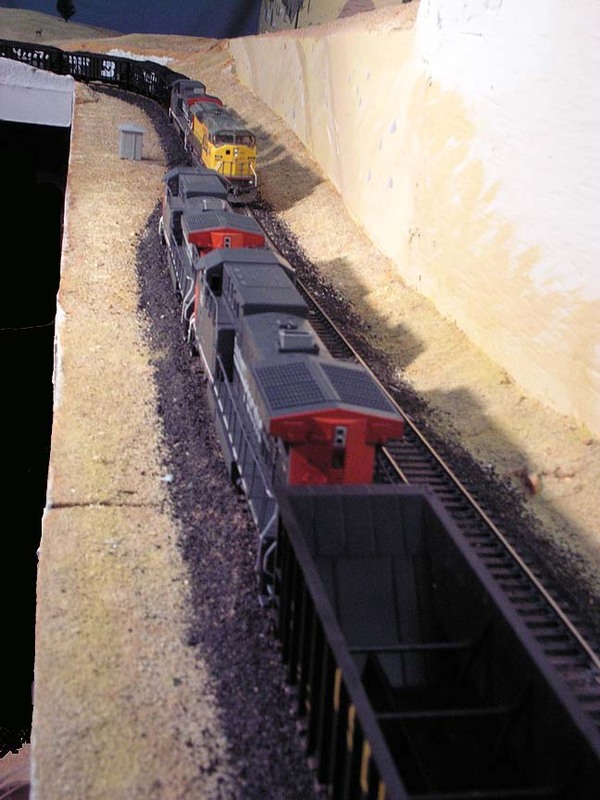 Here the CAICK coal train (PSCX) meets the MDVRO at Clay. DRGW tunnel motor 5390 is trailing on the MDVRO, and will be dropped off in Helper, UT after undergoing its 92-day inspection in Denver. 2003. 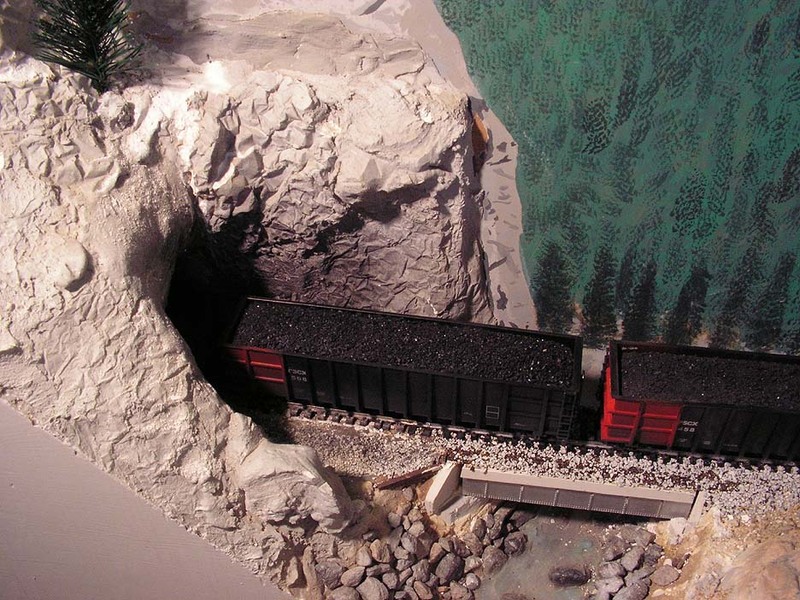 A typical 2-unit swing remote helper (both UP C44AC’s) is shoving in the middle of a coal train on the grade up to the west portal of Moffat Tunnel. It’s sunset in the Rockies. 2005. BNSF runs a mostly-daily trackage rights freight each way between Denver and Stockton. 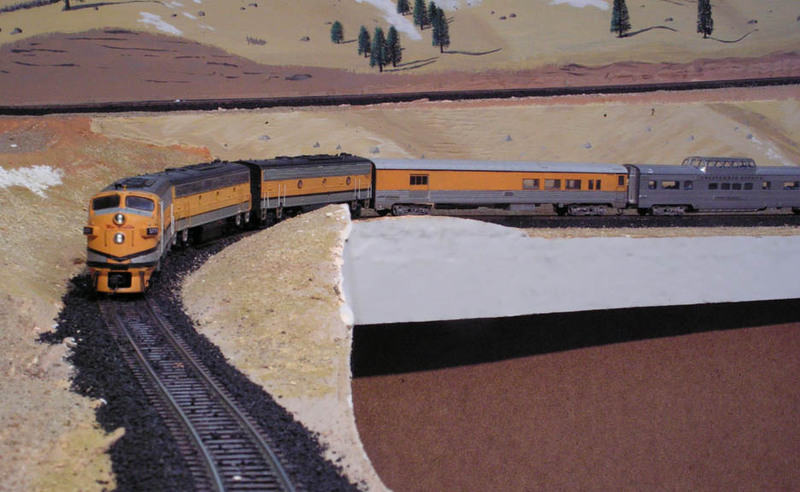 Here, the MDENSTO is passing Clay siding on its way west. By this time, power nearly always consists of C44-9W’s (often including DPU on the rear), though the paint schemes sometimes vary a bit. 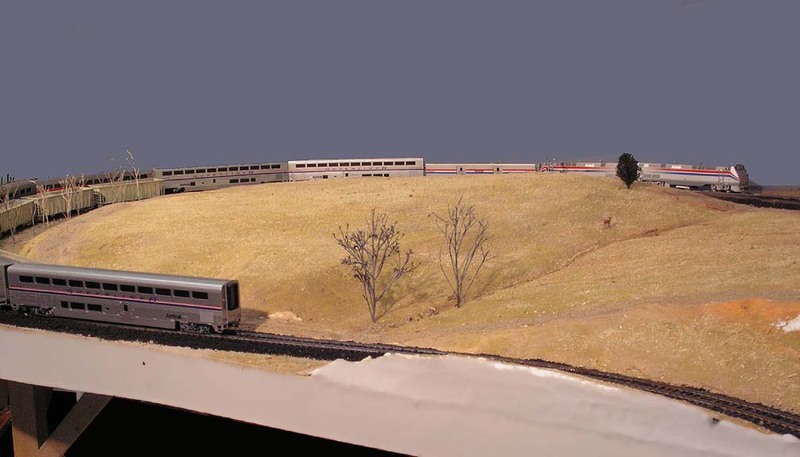 Here we see an H1, a Warbonnet, and an H2. 2006. North Yard is now mostly filled with yellow locomotives, particularly the switcher fleet. 2007. 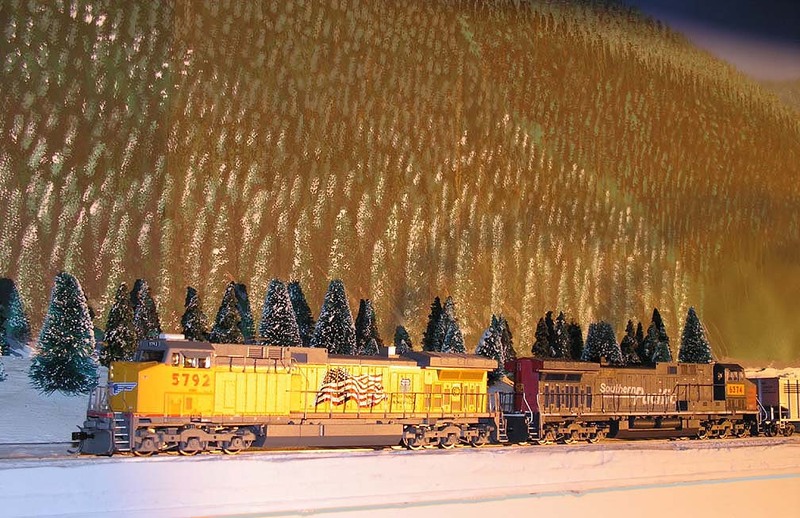 Dawn finds an eastbound coal train creeping through Winter Park siding in the chilly mountain air. 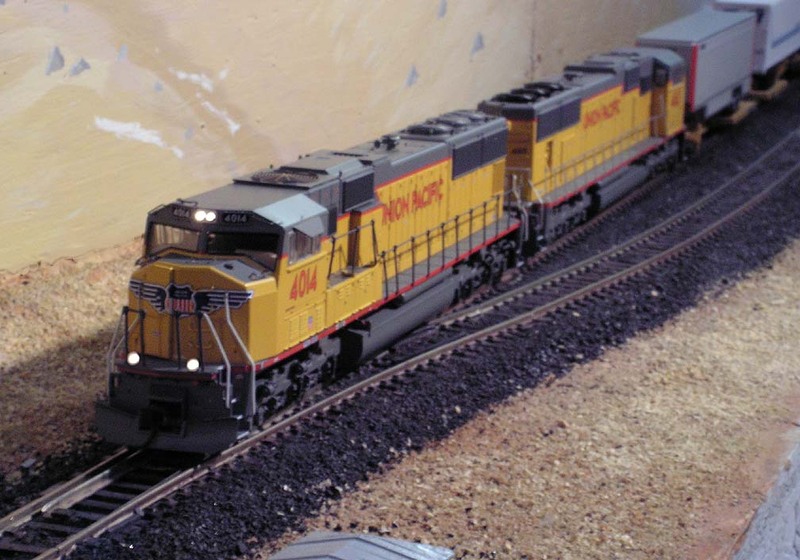 A 5-year-old C44AC-CTE and a patched ex-SP AC4400 lead the train.